We had a wonderful time celebrating Christmas in Texas with my family. Due to the large amount of pictures and my limited attention span, I'm only going to post the first leg of the trip today. We headed to Texas on Saturday, but made a very special stop on the way. My friend Lexie and I met almost 16 years ago (man Lexus, we're getting old...). Together we survived the awkward days of middle school, the drama of high school, and living in a very cramped dorm room in college. About three weeks ago, she gave birth to a beautiful baby boy named Hudson. Unfortunately, they live in Texas so I hadn't gotten to meet my nephew. So...we remedied that problem on Saturday and stopped in to visit the baby for a few hours (and his parents too). Hudson was absolutely perfect while we were there - he slept, cuddled, occasionally opened his precious eyes and even smiled a few times (gas?). These are the only pictures I got, but you can see how excited Madigan was to get to "hold" Hudson. She's talked about it for over a week now! He's a wonderful baby and we look forward to getting to watch him grow up. Thanks for letting us visit! After that, we headed to another friend's house in the metroplex and spent the night with them. After church the next morning, we made our way to Mema and Papa's house. My parents had made the trek out to West Texas and picked up my dad's dad (Grandad) and drove him to Mema and Papa's. So, we got to spend the day with all of my grandparents, my aunt, uncle and cousins, my brother and his family, and my parents. It was a full house! It was also a lot of fun. We ate (WAY too much) and then opened presents. We also took family pictures while we were there. 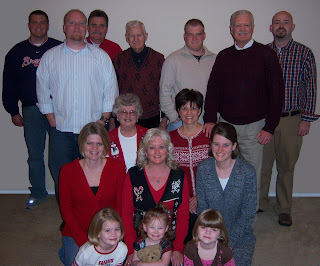 This was the first time in 5 years we had the whole family together to take pictures. We had a fantastic time and were so glad to get to see everyone together. Thanks to Mema and Papa for letting us destroy your house in the process! So glad you all had a wonderful Christmas! Hayley has a shirt like the girls do as well - the red one. Gotta love Kohls!